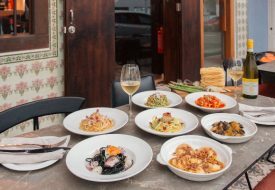 Hand-made pastas, customisable creations, flavourful toppings and generous portions – Pasta Supremo is the place to go for a hearty, wallet-friendly meal! 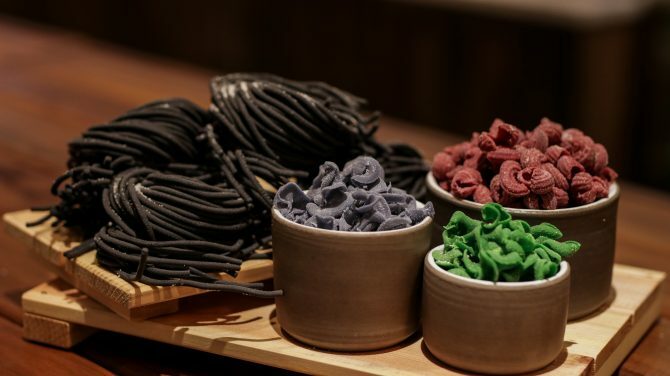 A pop-up restaurant opened by the same folks behind Taiwanese zi char restaurant The Salted Plum, Pasta Supreme is a casual go-to pasta haven that offers unique, customisable hand-made pasta creations that are full of flavour and affordable. 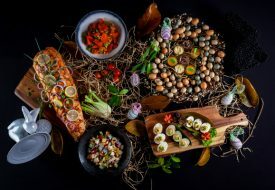 Founder Shawn Kishore believes in “making atas (high end) food accessible”, and this is reflected in the range of offerings on the menu: it’s $6 for a petite-sized (100g) bowl of Haus Marinara pasta, to $15 for the 300 Day Grain Fed Fatty Wagyu! 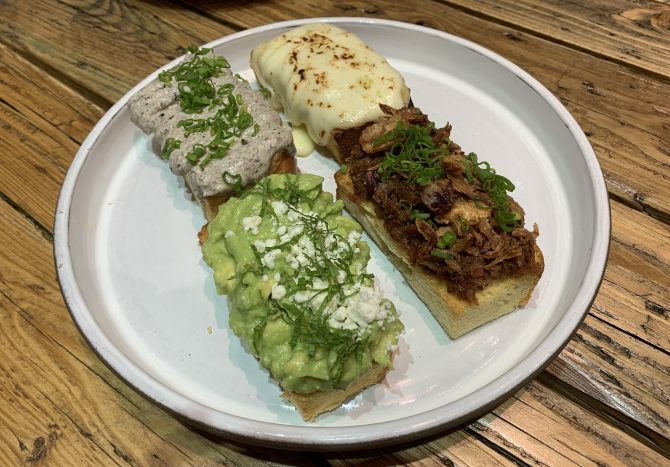 Moreover, portions are varied, so you don’t have to worry about having small or big appetites, or whether you’re coming alone or with friends – there’s options for everyone here! 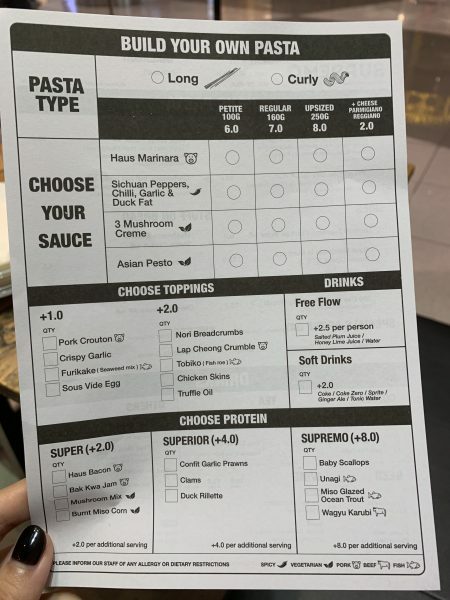 What’s unique about Pasta Supremo is that you can get creative and customise your own pasta! 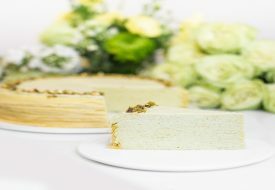 Choose from a selection of vibrantly-hued and naturally-dyed homemade pasta (we loved the Curly Pasta, dyed with blue pea flower), sauces and a range of toppings such as Burnt Miso Corn, 24-month aged Parmigiano Reggiano, Wagyu Karubi, and the much-talked-about Bak Kwa Jam. 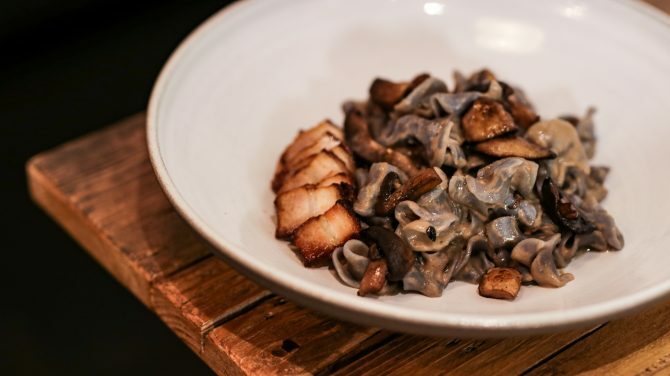 The Carbonara, but not really ($16) would be the perfect pasta dish for mushroom lovers: a creamy al funghi sauce is tossed with butterfly pea-dyed Curly Pasta; sautéed shimeiji, button and shiitake mushrooms, and finished off with 24-month-aged Parmigiano Reggiano and thick-cut Haus Bacon. Hearty and comforting, this was a pasta that warmed our tummies without feeling overly heavy. If you love your meats, go for the Supremo Porky Marinara ($14). 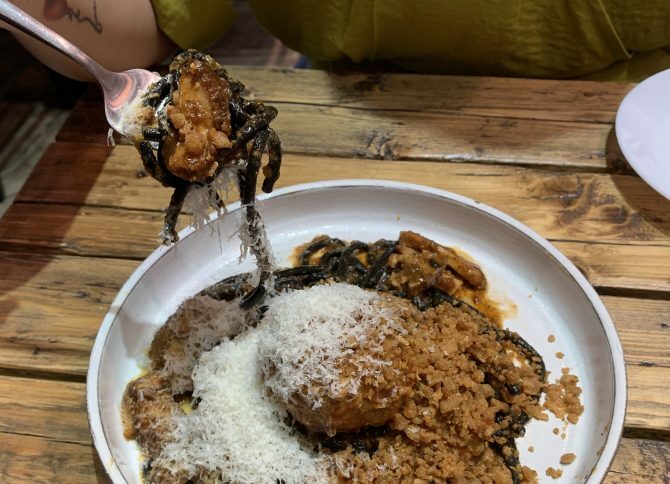 Made with a classic tomato base, Haus Bacon, a huge homemade pork meatball as well as long pasta dyed black with activated charcoal, this dish came topped with crunchy croutons of lard and generous shavings of Parmigiano Reggiano. The pork meatball was gigantic, and had a lovely crunch thanks to the bits of water chestnut inside, reminding us very much of ngoh hiang. The pasta also had a delicious texture due to the lard! 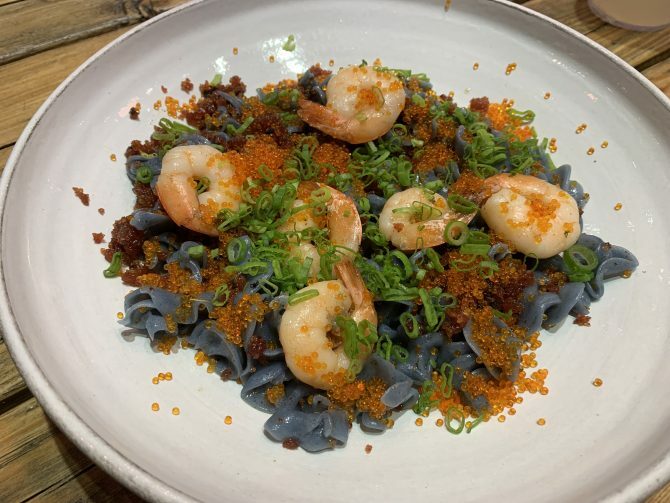 One of our favourites, and the most photogenic of the lot, was the Prawn Olio Olio ($18): Curly pasta laced with Sichuan garlic oil, and topped with Garlic Tiger Prawns, moreish Lap Cheong Crumble and savoury Tobiko. We loved the interplay of textures, and the mala-inspired flavour and spicy kick this dish had! For vegetarians, there’s the Vege Wege Pasta ($16). However, it’s way more than a mere vegetarian option, and was one of our top picks! 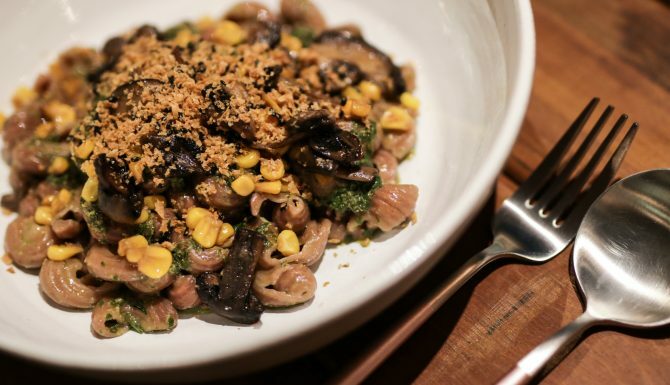 In this dish, Curly Pasta is tossed with Asian Pesto sauce (A Thai-inspired sauce made of extra virgin olive oil, fresh Thai basil leaves, kaffir lime leaves, lemongrass, candlenut and garlic); Burnt Miso Corn and an assortment of mushrooms such as shimeiji, button and shiitake with a sprinkling of Seasoned Breadcrumbs, and 24-month aged Parmigiano Reggiano cheese. Fragrant, mildly-sweet, and deliciously savoury, this pasta wouldn’t make you miss meat at all – we almost finished off the whole serving! The sides at Pasta Supremo are just, if not even more, amazing than the pastas themselves; and perfect if you’re popping by for a quick bite! The Stuff on Bread is a great choice paired with coffee or tea: toasted sourdough is topped with your choice of Mushroom & Black Truffle Cream ($4); Avocado & Feta ($4.50), a refreshing combination of avocado, feta and mint; Cheesy Cheese AF ($5) – a mix of blue cheese, mozzerella and brie; and Pasta Supremo’s coveted Bak Kwa Jam ($5): a deliciously fragrant “jam” made from from house-made bacon and bak kwa that is both sweet and savoury. 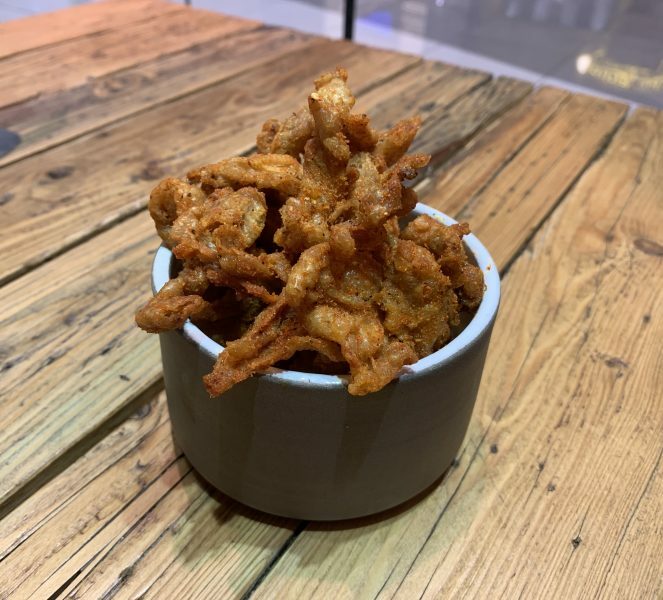 If you’re coming with friends, we recommend ordering the Spiced Supremo Chicken Skins ($6) – addictively crispy, mildly spicy bits of fried chicken skin that get their crunch from being dehydrated, then deep-fried. We couldn’t stop snagging more of these – and we think they’d go well with a Netflix marathon! Otherwise, the 300 Day Grain Fed Fatty Wagyu ($15) is a delicious, luxurious option too! 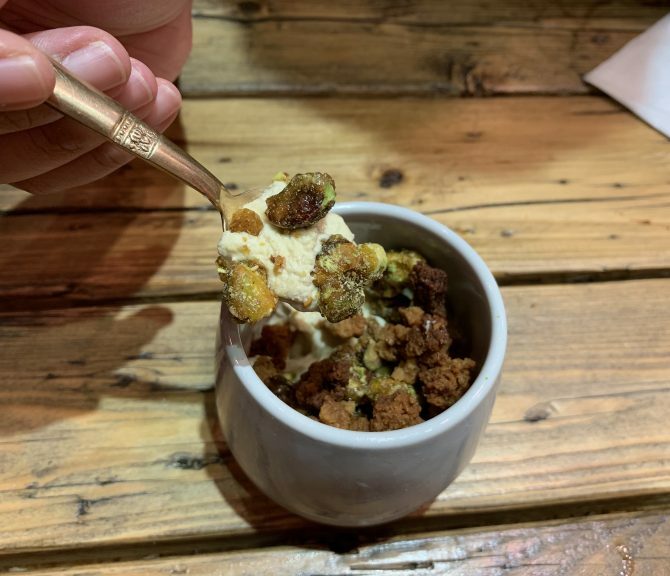 To finish off your meal, the Pistachio Creme ($6) is a simple yet wonderful dessert creamy pistachio mousse topped with a crumbly pistachio praline and caramelised pistachios that we would fork out money for a bag for! 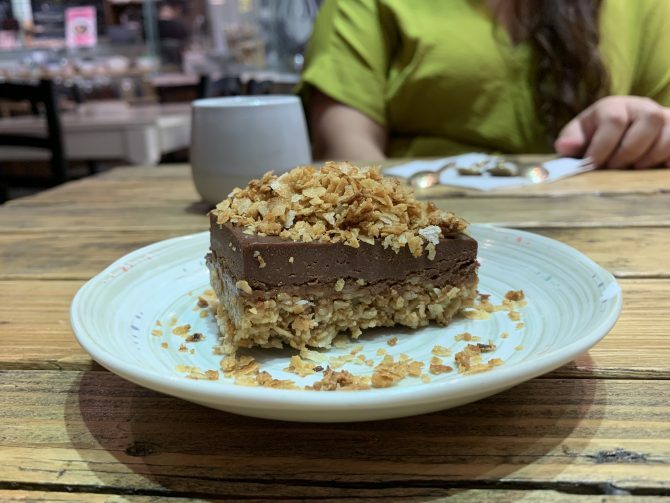 Otherwise, check the board for the Sweets of the Day ($6): we got a slice of Chocolate Oat Bar: rich, and not-too-sweet, with a delightful hint of fruitiness that reminded us of a Blackforest cake! With generous portions, creative and fresh ingredients, and hearty offerings; Pasta Supremo is the place to go if you’re craving pasta without breaking the bank!